The Duo 11 is a very exciting slider hybrid which has an 11″ capacitive touchscreen also has an active digitizer which allows from extremely precise natural handwriting (‘digital ink’) input. All Duo 11 models come with an 11.6″ 1920×1080 (1080p) screen, the aforementioned stylus, and a 4960mAh battery. There’s also an optional ‘sheet’ battery which nearly doubles the total capacity (sheet battery adds 4830mAh) when attached underneath the Duo 11 Ultrabook. RAM on all Duo 11 models is 1600MHz (fastest supported by the chipset). The Duo 11 weighs 1.3kg and the is 18mm thick which is the limit for Ultrabooks with screens 13″ and below. The Duo 11 price starts at $1099 which gets you the ‘SVD112190X’ model which has an Intel Core i3-3217U (1.8GHz, no Turbo) processor, 128GB SSD, and 4GB of RAM. If you customize this base model you can bump to CPU up to the Intel Core i5-3317U (1.7GHz, 2.6GHz Turbo), up to 6GB of RAM, and up to a 256GB SSD, with a price of $1369. The top-end Duo 11 is priced at $1499 and will get you the Intel Core i7-3517U (1.9GHz, 3.00GHz Turbo), 8GB of RAM, and 256GB SSD. Update: Some models are indicated to have a ful sensor set including GPS and NFC. Here is technical comparison of the three Intel Core Ivy Bridge processors available on the Duo 11. 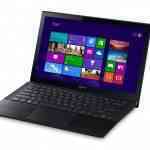 All specs, links, images and videos are in our database: Sony Vaio Duo 11 page. 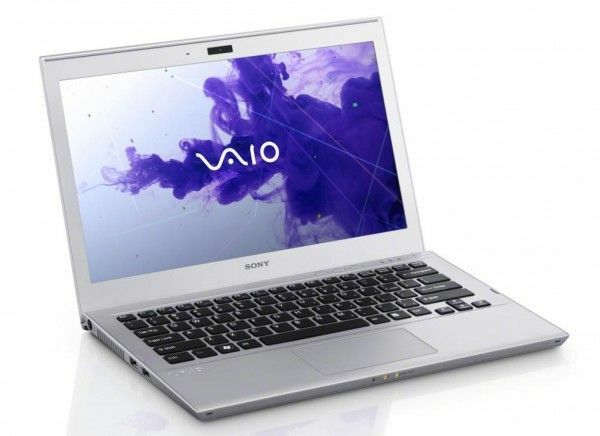 As we noted the other day, Sony is launching a touchscreen version of the Vaio T13. 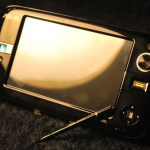 The touchscreen T13 is identical to the standard T13 aside from the touchscreen. The cheapest T13 you can get with a touchscreen is the ‘SVT131290X Enhanced’ which starts at $899 and has some customization options. The $899 model includes the 13.3″ 1366×768 touchscreen, Intel Core i5-3317U (1.7GHz, 2.6GHz Turbo), 500GB HHD (w/ 32GB performance cache), and 6GB of RAM. The top uncustomized T13 touchscreen model is ‘SVT13128CXS’ which is priced at $1299. This one comes with all the same as above except it adds the Intel Core i7-3517U (1.9GHz, 3.00GHz Turbo), 256GB SSD and 8GB of RAM. You can actually customize the $899 model up beyond that if you’d like by adding up to a 512GB SSD. With all hardware options maxed out you’d be looking at a $2099 price tag. 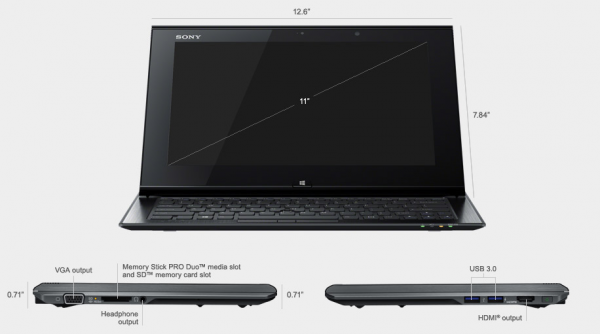 Find the T13 on Sony’s site here. 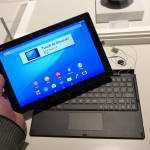 Sony has dropped the price on their non-touchscreen version of the T13. We were impressed by the $769 starting price back when the T13 launched. Now Sony has managed to shave $100 off the price which brings the starting model to $669! We’re pretty impressed with this; from our testing the T13 is a well designed product from the hardware perspective regardless of the price. If you are looking for a value-Ultrabook, don’t miss the T13! 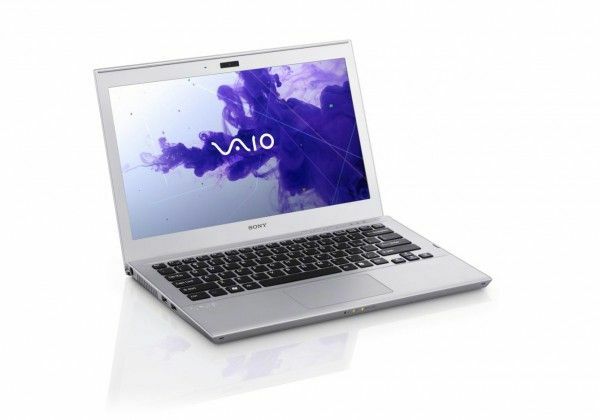 The $669 model comes with the Intel Core i3-3217U (1.8GHz, no Turbo) processor, 320GB HHD (with 32GB SSD performance cache), and 4GB of RAM. For $70 you can upgrade to the Intel Core i5-3317U (1.7GHz, 2.6GHz Turbo) which we would recommend to get access to the Turbo Boost functionality for faster performance. You can also add 2GB of extra RAM for an extra $30 but we’d recommend skipping that option and instead sticking with 4GB of RAM. You can easily add the extra 2GB of RAM (or more) for much cheaper because there is an open slot that you can access on the bottom of the T13 (just make sure you get DDR3-1600MHz RAM). This will get you started for 2GB RAM sticks. 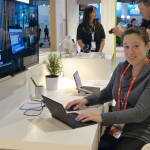 Vaio T11 Standard and T11 Touchscreen? We can’t imagine any reason that Sony would drop the T11, though they never launched it in the US market likely due to market trends (Asus also never launched their 11″ UX21A in the US). 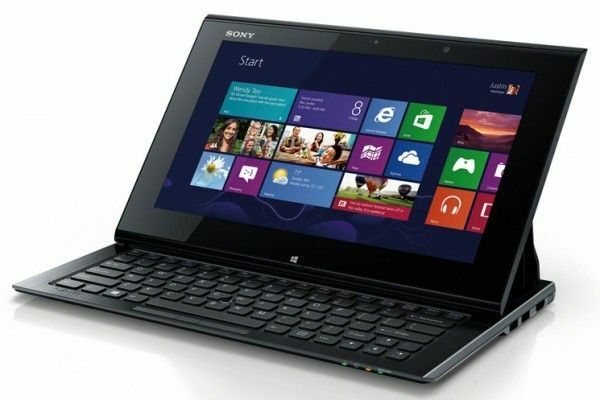 There was no announcement from Sony US regarding the T11 with Windows 8/touchscreen or otherwise. European Sony sites don’t seem to have started their Windows 8 marketing yet but we’ve got to imagine we’ll at least see a Windows 8 version of the T11 if not a touchscreen equipped variant as well. Whether or not it’ll be available in the US is less clear. Too bad the T series screens are dark (only 190 CD/m2) have bad contrast due to 1.0 black value, and to make matters worse, they’re glossy, so in bright light, you got yourself a nice cosmetic mirror instead of a computer display. Futher, the vertical viewing angles are so bad that uniform colors look different in the center than at the upper or lower edges of the screen.